"Erdogan's claims that 'There is no Islamic terror' have left several Islamic terror organizations heart-broken. A press release from al-Qaeda's press office read: 'The prime minister's remarks are very discouraging. We are doing our best!'" – Zaytung (satire website). In 2010, Barack Obama referred to Turkey as a "great Muslim democracy". Obama should have seen that a democracy is a democracy -- without any religious prefix. He would see in later years the difference between a democracy and a Muslim democracy. Several years ago, Erdogan's ideological-self clearly stated that "Turkey is not a country where moderate Islam prevails." In the same speech, his pragmatic-self -- the one that wanted to look pretty to a chorus of Western praise -- added that, "We are Muslims who have found a middle road". But which "middle road?" 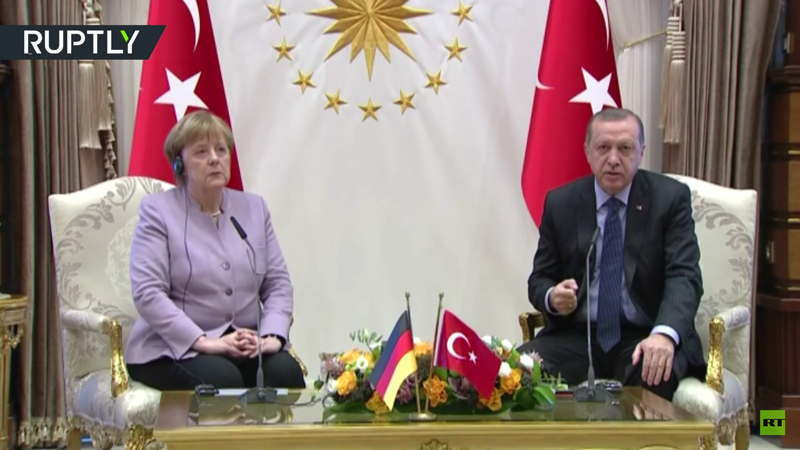 In February, at a meeting in Ankara, Erdogan slammed German Chancellor Angela Merkel's phrase "Islamist terror". He angrily said to his guest, "Islam means 'peace,' it can't come with 'terror'". When Erdogan (then prime minister) famously claimed that "there is no Islamic terror" in 2010, the satire website Zaytung fabricated a story, the lead paragraph of which read: "Erdogan's claims that 'There is no Islamic terror' have left several Islamic terror organizations heart-broken. A press release from al-Qaeda's press office read: 'The prime minister's remarks are very discouraging. We are doing our best!'". In 2011, when Hamas' charter called for the annihilation of the State of Israel by means of violence, Erdogan claimed that "Hamas is not a terrorist organization." Instead, he said: "I don't see Hamas as a terror organization. Hamas is a political party -- it emerged as a political party that appeared as a political party. It is a resistance movement trying to protect its country under occupation". In a similar show of ideological wishful thinking, Erdogan has often come out in defense of the Egyptian Muslim Brotherhood, despite international pressure against the movement, particularly from the United States, which has debated listing the group as a terrorist organization. Erdogan said he did not consider the Brotherhood one because "it is not an armed group, but is in actual fact an ideological organization". In a 2010 interview with the Italian daily Corriere della Sera, Obama referred to Turkey as a "great Muslim democracy". Obama should have seen that a democracy is a democracy -- without any religious prefix. He would see in later years the difference between a democracy and a Muslim democracy. "Early on, Obama saw Recep Tayyip Erdo?an, the president of Turkey, as the sort of moderate Muslim leader who would bridge the divide between East and West — but Obama now considers him a failure and an authoritarian..."
The Trump administration has two options: It can either deal with the Turkey it has or the Turkey it wished it had.